The short stretch of bus lane at the inner-London end of the motorway was introduced in June 1999 by John Prescott — probably our best and most progressive transport secretary ever (which is one of those non-achievements like “most reliable train operator” or “most likable cab driver”) — and was something new and difficult to understand. The government tried to explain how it would help everybody, how Motorists themselves would benefit from it, but all anybody heard was that the amount of concrete that Motorists could put their cars on was going to be reduced for the first time ever. The media were desperate for it to fail. What if it set a precedent? Take this fabulous rant from a BBC correspondent, in the days before BBC correspondents had their teeth filed for fear that they might be accused of anti-Tory bias. The irony is that the purpose of the M4 bus lane was not any different to any roads policy that had come before. In today’s favoured terminology, it was introduced to smooth the traffic flow: to make journeys faster and easier for the Motorist on the M4. The issue is explained with nice diagrams here. I won’t try to explain the whole thing in words (well, I did try, and failed, and deleted it), but the take home message is that the rate-limiting step for this section of the M4 is a bottleneck at Brentford that can never be eliminated. Where that bottleneck occurs, three lanes became two, causing merging and lane-changing throughout the three-lane section — behaviours which are known to slow overall traffic flow. By effectively making the M4 consistently two lanes wide, the bus lane is in fact a clever hack to make the traffic run more smoothly and reliably. It needn’t be a bus lane at all, it only needs for this section to be consistently two lanes wide instead of three lanes merging into two. And it works. Despite having less space, and despite the reduction in speed-limit that coincided with the change in layout, journey times for all road users fell after the bus lane was introduced. (Only by seconds or minutes — it’s a very short stretch of road — but you know how much a second means to a Motorist.) And with less lane-changing, accident rates fell. Even the Daily Mail had to acknowledge that it had been a successful implementation of an evidence-based intervention for improving journey times, reliability, and safety. The lane improved journey times by about one minute. Removing it will probably cut journey times by about one minute. It will affect cabbies marginally more, and every few days the Motorists will close the road by smashing up their cars when changing lanes. It doesn’t matter; it never mattered. But installing it had the symbolic significance of suggesting that the government might, for once, now and then, just consider transport policies that go beyond Motorism; to occasionally provide for more than just the car user. Its removal is the symbol of the opposite stance: that this government will continue to provide for the car, and nobody else. Obviously. Got to get those fires extinguished, and all that postponed cancer surgery done. Can’t have the country descend into anarchy. It would be unsafe and unhygienic not to. People gotta eat before they starve; crops gotta be harvested before they spoil. Well, I suppose there’s an economy needs getting back up to speed. Uh, well, alright, I suppose they are “essential”. “Essential services” for definitions of “essential” that include “saving a politician from having to get on a bus.” Sounds like another call for the Old Ladies’ from the Job Justification Hearings. The Guardian speculates on the likely effects of the bicycle hire scheme that launches tomorrow morning, based on observations of other cities that have mature systems. The scheme is not expected to make any significant difference to private car journeys. This is hardly surprising. Some London drivers of course can not easily switch to the hire bike — deliveries, and the disabled. Most, though, will not. Ever. Most London drivers are the kind of bankers and drug dealers for whom there is simply insufficient mental capacity to even begin to understand how harmful, selfish, and ludicrous their behaviour is. The congestion charge does not affect them; parking charges go unnoticed; no amount of traffic jams will get them out of the shell that protects from the proles. Like religion and conservatism, driving in London is purely irrational; impervious to reason. This we already knew. What the hire bikes are expected to provide is faster journeys for those who would have walked; relief for overcrowded trains and buses; and most interestingly, a cut in taxi journeys. During the day, bike hire will displace a particular type of taxi journey: the businessman, journalist, politician, academic, civil servant whose journey is short, but has a strict deadline in a busy schedule. The bus wastes time at stops; the tube station too far away; you don’t have time to wait and you can’t take even the remotest risk of getting stuck in a tunnel. So you reluctantly flag a cab. Except that, now, with docking stations outside both your office and the place of your important meeting, and an ominous queue of traffic building at the end of the road, the hire bike looks like the faster and more reliable option. 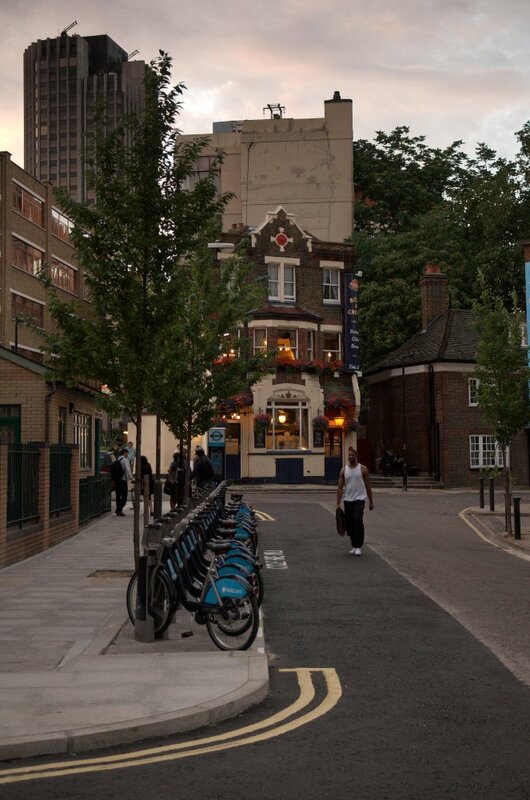 These hire bikes are conveniently located outside the Rose and Crown in Southwark. Meanwhile, at night, when the last tube has left, and the night buses have filled with tramps and creeps, wannabe gangsters and spotty chavs, one might have found tempting a taxi home from your late evening working, your evening classes, cultural performances, or — we know you — pub. Now you can grab a hire bike, and sober up with the wind in your face. This leads us to the inevitable conclusion that the full introduction of the bike hire scheme must be followed immediately by at least two other changes to London’s transport infrastructure. Firstly, the clear evidence we see is that London’s streets already host an extravagant surplus of taxis, driving around empty, producing enough pollution each for a thousand of us, or else sat idle on the side of the road, day and night, occupying valuable central London land. The bike hire scheme makes our quaint old fashioned taxis even more redundant and, for the sake of the taxi drivers who will be facing ever tougher competition for fares, their numbers will need to be reduced. We propose retraining the drivers to operate the cute little electric trucks that will redistribute bikes from popular destinations back to popular starting locations. 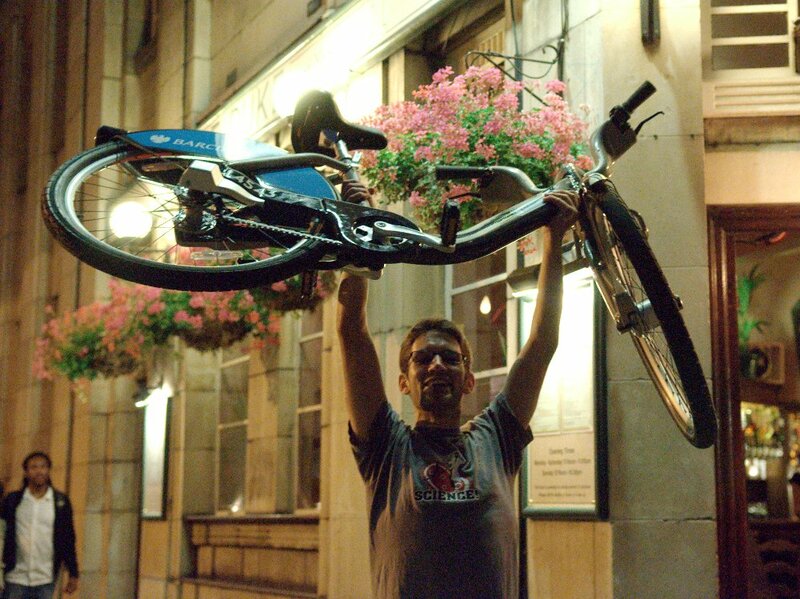 Secondly, there will be a jump in the numbers of people taking a hire bike home from the pub. They are liable to wobble, and, if action is not taken now, could end up scratching an Important Person’s paintwork. Which is why next week we will be explaining why there is sadly no avoiding the fact that the time has come when, for the Motorist’s own protection, we simply have no choice but to remove all private cars from unclassified roads in zone one.